As explained in this post, the Starz Denver Film Festival is once again upon us, and I have been relating my experiences with the various films I see in daily reports. I’m doing something a little different today. Since I only saw one film on Sunday, and it was awful – the Italian film Human Capital, which was about as tedious a movie as I have ever forced myself to sit through – I’m going to forego any discussion of it, and tackle the one film I haven’t talked about this weekend – Joshua Oppenheimer’s The Look of Silence, which I saw Saturday night – in its own full review. The film certainly deserves the attention. For all Starz Denver Film Festival 2014 coverage, please visit this link. 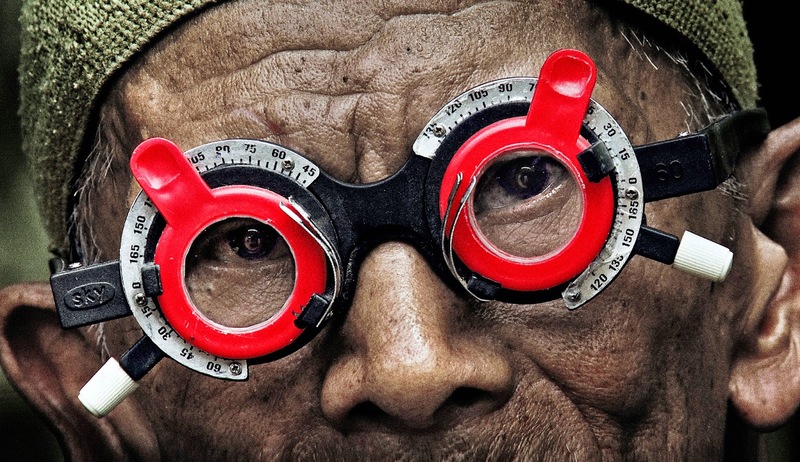 Joshua Oppenheimer’s The Act of Killing has already taken on near-legendary status in the realms of documentary filmmaking, its bold and original approach to exploring the 1965 anti-communist massacres in Indonesia, through deep interaction with the killers themselves, forcefully grabbing the attention of critics and scholars alike – myself included. The film made my Top 10 list last year, and I don’t think I’ll ever be able to shake everything the film had to say about the nature of evil and the ways people who have done terrible things repress and displace guilt. It’s a real documentary masterpiece. And The Look of Silence, Oppenheimer’s direct follow-up to The Act of Killing, is even better. Structurally, this is a much simpler film than its predecessor. Where The Act of Killing had dense layers of content to sift through – interviews with the killers, introductions to Indonesian history (and propaganda), the filmed recreations of the massacres, the reactions to the recreations, etc. – The Look of Silence follows one man, Adi, on his journey to try understanding the people who murdered his older brother during the killings. An optometrist and family man, Adi was born in 1968, three years after the killings, yet is still deeply scarred by the massacres. Growing up in a nation that has actively suppressed and distorted its truth, with the killers themselves living freely and in power, Adi has had to learn to be polite and deferential towards the people who murdered his brother, even as he harbors a seething frustration and confusion over the horrific violence they perpetrated. Oppenheimer gives Adi the opportunity to interview several people involved with the massacres on camera, from local murderers and the village death squad leader all the way up to a member of Indonesia’s legislature. As Adi confronts these people, he grows increasingly bold and forceful in his questioning, trying with quiet desperation to make somebody admit responsibility for his brother’s brutal murder. In one of the film’s most powerful moments, Adi explains that he needs to have one of the killers voice responsibility and regret – to reveal themselves to him as human beings, with feelings and shame – before he can start to forgive these people. The need for forgiveness is a compulsion for Adi. He has no desire for revenge, but if he is to live in this world, where the killers are glorified and his children taught propaganda at school, he needs to be able to find some measure of peace with these people. The Look of Silence, then, is a story of struggling to find forgiveness and absolution, and while that makes it a more narratively direct film than The Act of Killing, its emotional dimensions are so much more complex and unfathomable. I cannot even begin to imagine the kind of pain and confusion Adi lives with on a daily basis, and I can only admire his truly incredible instinct towards forgiveness. I have no idea what I would do were I in his situation, but I doubt I would be that strong or humane. Nor would I have the bravery to confront the killers the way Adi does here. Where Oppenheimer himself was the prime interviewing voice in The Act of Killing, Adi is the investigator and instigator here, and he doesn’t have Oppenheimer’s same talent for calmly, stealthily coaxing major revelations from his subjects. How could he? Oppenheimer approaches this material from a remove, an outsider covering a national tragedy, but Adi exists at the epicenter of all it, having been born into a broken world, with his family scarred and torn apart. As a result, the interviews here become significantly more fraught and dangerous than they were last time, with each killer or politician Adi speaks to either becoming uncomfortable and outraged, or warning Adi that he is heading down a deadly path. These interview sequences are the film’s masterstrokes, each one of them a complex and harrowing emotional journey in and of themselves. Oppenheimer’s talent for letting moments linger, for leaving space in the editing to see the natural progression of a person’s reactions during an encounter, is used to full effect here, and studying how Adi gradually finds a confident, piercing voice over the course of each individual interview, and of the film itself, is one of the most emotionally taxing and rewarding things I have ever seen in documentary filmmaking. An early interview with Inong, a local death squad leader, plays out like the film in microcosm; Adi, who visits Inong in part to give him an eye exam, starts by asking simple questions, like how Inong met Oppenheimer (the director has footage of Inong bragging about the killings, similar to what was seen in The Act of Killing, dating back to 2003). As Adi starts to push further, though, it becomes clear that Inong is not only unrepentant, but utterly possessed of his own power. Adi keeps going, though, and the interview becomes a fascinating dance back and forth between the two men, Inong happy to brag and share his experiences – like a chilling monologue of the necessity of drinking a victim’s blood – while staying wary of Adi’s motivations, and Adi trying to coax a statement of responsibility from Inong without going too far. “Your questions are too deep,” Inong finally proclaims, Adi having clearly gotten deep under the man’s skin, which only emboldens Adi to go further, confronting Inong directly with the propagandist lies of the state. At this point, I’m not even sure I was breathing – the interview is that riveting and complex. The Look of Silence touches upon several topics The Act of Killing only mentioned in passing; several sequences deal with America’s involvement in the killings – “We did this because America taught us to hate the communists,” says the leader of the Snake River death squads – and greater focus is given to the overwhelming propaganda Indonesian citizens live with, and the sheer depths of denial many people have fallen to. But the most important new perspective here is indeed Adi’s, for if The Act of Killing was an examination into the psyche of a killer, The Look of Silence is an attempt to understand what it is to be a victim, to be made voiceless and powerless, in an extreme circumstance such as this. With each passing interview, Adi’s emotional state becomes increasingly raw and vulnerable, tears welling in his increasingly red eyes more and more as the film goes on. This process is clearly tearing him apart, but it is also providing him some much-needed catharsis; even if he cannot get the killers to admit responsibility, getting to ask these questions and openly challenge the established order offers a kind of release, a chance to let the indignation that has been building inside of him all his life to finally burst forth. We get some fascinating perspective on the killers too along the way – the descriptions of murder here are a lot more graphic than last time, in keeping with the tragic story of Adi’s brother – and some heart-wrenching moments of empathy between Adi and people related to the killers, moments where the children of murderers and victims alike come together to share in their national trauma. But at the end of the day, this film is about Adi, peeling back the layers of a brave and thoughtful man, born into a broken world, trying to reconcile what it means to live in a status quo of violence, corruption, and moral degradation. As a result, the emotional impact of The Look of Silence is inconceivably vast. Where The Act of Killing left me intellectually stimulated and deeply horrified, The Look of Silence prompted a much more complex set of emotions. I felt disgusted by the descriptions of murder, disturbed by the cavalier attitude of the killers, sympathetic to Adi’s pain, and conflicted and confused about the lack of responsibility and regret on display in the interview subjects (in a way, The Look of Silence is like a modern version of Night and Fog, Alain Resnais’ landmark holocaust documentary, which asks the question “who is responsible?”). Ultimately, though, I felt overwhelmingly sad, devastated, and heartbroken by the unresolvable human dilemmas on display in Adi’s story, and the situation of Indonesia on the whole. This is a profoundly emotional film, but not in cloying or manipulative ways – it portrays Adi’s experiences honestly, and seeks impossible truths with a clear and concentrated eye (reflected in the recurring visual motif of Adi’s optometry equipment). Simple answers are nonexistent, but the complex depths of the human conditions probed herein are virtually unparalleled. Moreover, I think Oppenheimer has taken a clear step forward as a documentarian with this film. That is not a slight on The Act of Killing, but a recognition of how expertly he has simplified and pared down his storytelling here, exploring equally complex ideas and reaching even bigger emotional moments by focusing on one family’s tragic story – which, through extrapolation, allows him to express the weight of this unthinkable national tragedy. The Look of Silence is an impactfully arced and tightly composed film, sharp and immersive without an ounce of fat on its bones, even as Oppenheimer allows his footage to breathe in hauntingly beautiful fashion. Seeing The Act of Killing is not necessarily a prerequisite for understanding what Oppenheimer has achieved here, but the two films work so well in conversation with one another, each film immediately becoming more powerful and dynamic as a result of the other’s existence. As it stands, this is now a perfect two-film series, one where the sum is greater than the individual parts, and if Oppenheimer has any interest in continuing his explorations on this topic, I suspect subsequent installments could only make the emotional and intellectual web of his work all the more rich and compelling. For now, The Look of Silence is a major accomplishment, not only one of the great films of 2014, but one of the most moving, thought-provoking, and brilliant documentary films I have ever had the good fortune to encounter.